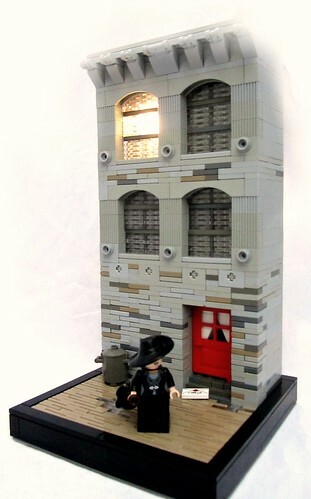 Brick Town Talk: The Woman and the Window - LEGO Town, Architecture, Building Tips, Inspiration Ideas, and more! Bleak Boulevard - (BTT) The light is still on in the office of the hardboiled detective currently residing in this gritty piece of the urban streetscape. A femme fatale, her hat hiding her eyes almost as well as her words hide her true intentions, just stepped through the scarlet door to the misty alley beyond. Beyond these walls, as grey as the perpetually raining skies, the two seem to have entered a business arrangement that just reeks of trouble and cigarettes. Best keep that revolver (and umbrella) close.